Despite abortion now being legal in the Republic of Ireland, the Health (Regulation of Termination of Pregnancy ) Act 2018 means many people will still have to travel to Britain to access abortion care.This is the view of Galway Pro-Choice, which has noted that if a pregnancy exceeds 12 weeks (10 weeks gestation ) and there is no risk to the life, or of serious harm to the health, of the pregnant person, an abortion will not currently be permitted. Galway Pro-Choice has raised this as a concern following the recent case of a woman who had received a diagnosis of a “complex foetal anomaly” and was denied an abortion because of a clause in the current legislation which speculates that the condition of the foetus must mean it would die either before or within 28 days of birth, as per the Health (Regulation of Termination of Pregnancy ) Act 2018, Section 11. The woman has said she intends to travel to Britain for a termination as she says she was told verbally that the condition was fatal. Guidelines from the Institute of Obstetricians and Gynaecologists, released on January 18, and published in The Irish Times, stated that for some women termination of pregnancy in Ireland “may still not be an option”. Galway Pro-Choice said there were also other issues with the current legislation including the three day mandatory waiting period; the lack of exclusion zones around GP’s offices and hospitals providing abortions; the lack of regulation of 'rogue' crisis pregnancy agencies; and the continued criminalisation of doctors. 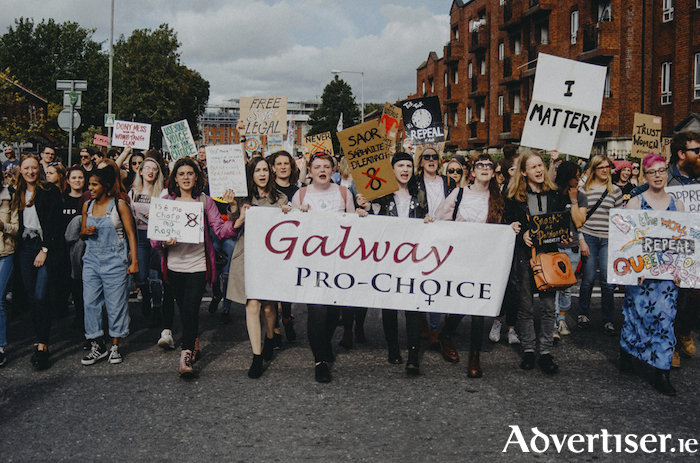 Galway Pro-Choice says it will "continue to fight for abortion access for all those who need it and to ensure free, safe, legal and locally accessible care in Ireland."